It’s real fun. I’m excited to be here. It’s a great team, L.A. I saw some games of theirs in the playoffs. It’s a really good team, a really good organization, so I’m really excited. I think I’m a big, strong player, a good skater. I think that’s my biggest strength – I’m a really good skater, so that’s what I’m going to bring to the LA Kings. Yeah, a two-way hockey player, a little bit of a power forward. I think that fits me good. They play hard, and they have really skilled players, too, so I think that fits well. I watched him a lot. He and Dustin Brown, I [watched] a lot, too. So they’re both really good two-way players, and are both skilled. Yeah, exactly. I just signed a two-year deal with Modo. Yeah, I talked with Ruuttu in Sweden a couple times, and then at the combine, too. So I met him a few times. I’ve had a good feeling. Yeah, I saw some games with the Kings. [Reporter: What did you think they were able to do this year, and how they played?] I think they played really well this year, and hopefully next year. 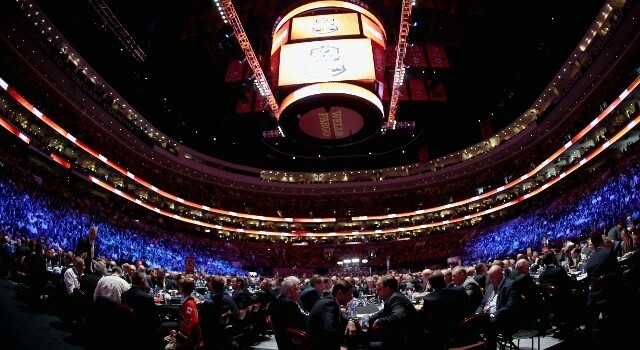 I think they’re going to be maybe the Stanley Cup champion next year, too. They have a really good team and everything, so they just keep going. 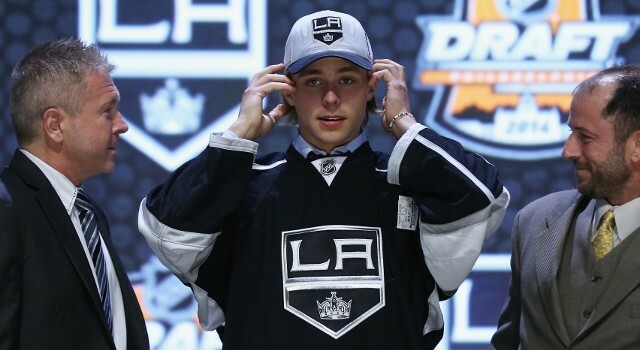 On Adrian Kempe being a “Los Angeles Kings-type player”: That’s exactly what we feel. We see him as a King. He’s got the speed. He’s got the size. He has bite in his game, and there’s a second effort in his game. All the intangibles we’re looking at, Adrian has that, and we’re really happy he was still available at this time. On being a younger player with Modo Hockey: He played really well. We were there…to see him score his first goal in the Swedish league, and he’s a player who will go to the net. I think we had probably seen him 24, 30 times this year, so we’ve seen him a lot. He was a key player for the Under-18 team for Modo when they won the Swedish Championship. He was playing on the same line with William Nylander, and Adrian was the guy who actually took the game over in the end and scored two big goals for his team to win the championship. On his first goal in the SHL: I remember the goal. It was a tip-in in front. He was going to the net, and he tipped it in in front. It was in Gothenburg. On having one year left on his contract, and whether he’ll return to Modo: I wouldn’t mind if he went back to Modo, but we’ve got to discuss and see what’s best for him and for us, where probably is the best place to be. On his character: He’s a very good person….kind of a little bit shy. He doesn’t take a lot of room early on. I talked to the coaching staff, how he’s been in the locker room with men, but on the ice, he’s a different player. One of the youngest players in the draft, and already plays with high intensity. Aggressive pivot had an up-and- down season; didn’t perform at his best with juniors, but raised his level in the SHL. Power forward in the making – forceful hitter finishes checks and has scoring ability. Has an absolute rocket shot, but accuracy isn’t always there. Good size and has a great frame to grow into. Determined battler all over the ice. Great speed with a terrific initial burst. Skates with a wide stance for balance, and is very shifty and elusive laterally. Dangerous off the rush, but needs to learn to evaluate when to shoot or slip a pass over to linemate. Could show better puckhandling poise – turns it over at offensive blue line trying too many moves. Agitates opponents with persistent chippiness. Carries his stick recklessly high on occasion and draws needless aggression fouls. One of the two shootout scorers for Sweden, forward Adrian Kempe, is certain to be an important part of his country’s efforts to secure a medal at this year’s tournament. For a country that tends to ice a more skilled group of forwards, Kempe stands out as more of a power forward rather than a straight skill player. He plays a style of game that could eventually lend itself very well to the North American brand of hockey employed in the NHL. With rare exception, playing time in Sweden’s top league is in scarce supply for draft eligible prospects. Kempe made the most of his opportunity by spending the majority of his season with MODO of the SHL. Like most young players, he didn’t play much, but left an impression with his speed, skating and offensive potential. When Kempe has played against his peers, he’s been one of the better players on the ice. 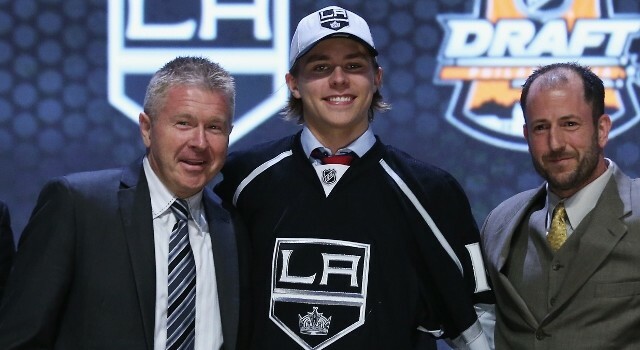 Adrian Kempe is a Swedish forward that plays more like your prototypical North American power forward. He is a very strong forechecker and excels in the corners and in front of the opposition’s net. He uses his size to separate from defenders and to drive hard to the net. He possesses a better than average shot with a quick release and handles the puck extremely well, especially in tight areas.